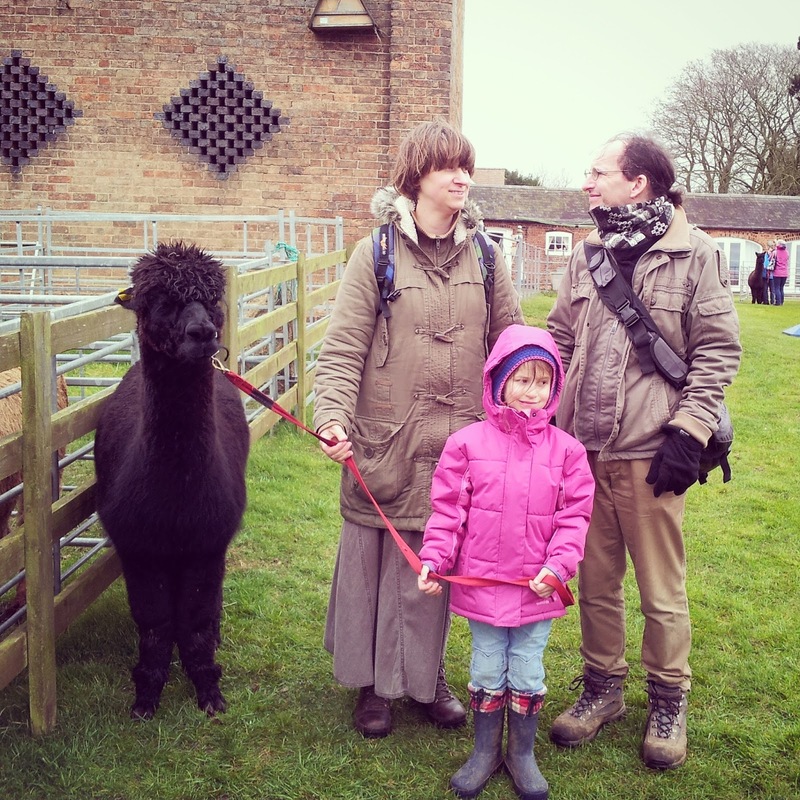 It is Easter weekend and the local alpaca farm (Toft Alpaca) hosted their usual farm open day today. 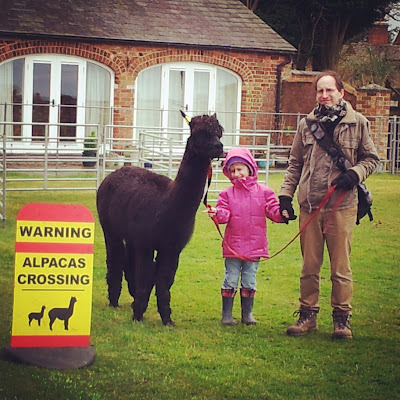 We introduced M to alpacas during a similar open day the Easter before she turned four, where she became hooked. I don't think we've missed a Toft open day since! The weather today was awful, starting out grey, drizzling by the time we left he house and gradually worsening to torrential rain by the time we drove home. The addition of a strong wind meant there was no warmth at all, and I suspect this is the reason the farm was quieter than it has been on previous Easter open days. It was still busy, but not heaving with bodies the way it was last time and there was plenty of room to park and the staff were not so stressed due to too many people on a small farm. Alpaca girls outside the studio. We decided to join the noon farm tour and while we waited, M explored the site. 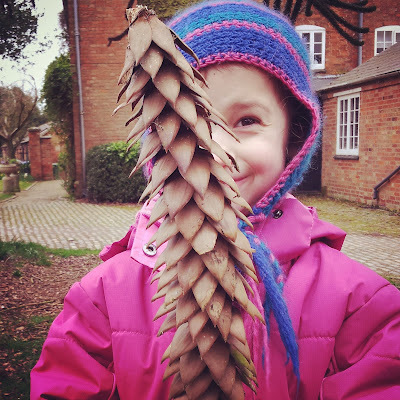 She loves the pond, examined the daffodils and discovered a huge monkey puzzle tree. The latter is to the side of the studio building and neither Dave nor I have seen such a big example of this curious plant. M couldn't stop looking at it, it was just so odd compared to trees she is familiar with. We looked the rings of scars from previous branches, the way the branches were formed, the leaf structure and speculated as to whether monkeys would live in such a tree. M with a fallen branch from the monkey puzzle tree. M picked up a fallen branch and was very taken with it, but we didn't have time to put it in the car as we needed to join the farm tour. We joined a large crowd braving the weather for a tour by one of the farm's owners, learning a fair bit about alpacas as we went. I'm not sure how much of the talk M listened to, but we trekked up and down steep hills, went into fields with alpacas and tried to avoid the poo! We made it back to the area outside the studio in time to join the Easter Egg Hunt. In previous years, the hunt has been around the pond, but (last year in particular) the number of children made the terrain dangerous and the hunt was over within a few minutes. This year, they decided to hide the eggs in a small section of managed woodland. We all lined up and waited for the rope to be dropped, then M started to look for eggs. Dave accompanied her at first, then I took over as we had a final sweep for any eggs the others might have missed. M came away with eleven little eggs, which made her happy. By now the weather was bad and we were cold, so it was time to retreat to the car to eat lunch. Not our favoured option, but we couldn't picnic outside so we made the best of the situation. 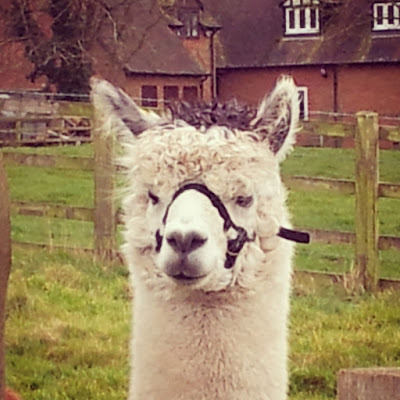 For M, the draw of Toft is the chance to walk an alpaca on a halter. Every time we go, she picks out the feistiest animal and off we go. After eating we made our way to the paddock where the farm sets up a small obstacle course to lead the alpacas around. 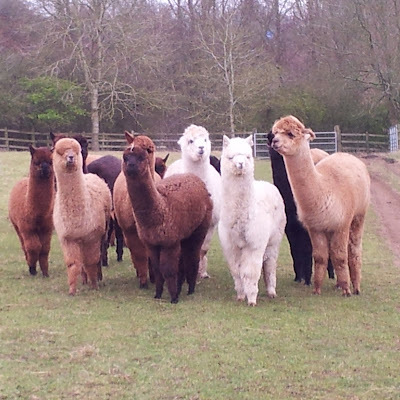 M watched the previous group for a while before declaring she wanted the black alpaca. For the avoidance of doubt, M informed the man in charge of her choice before we had made it through the gate. M and Dave with M's chosen alpaca. This curious chap was watching us as we walked alpacas. 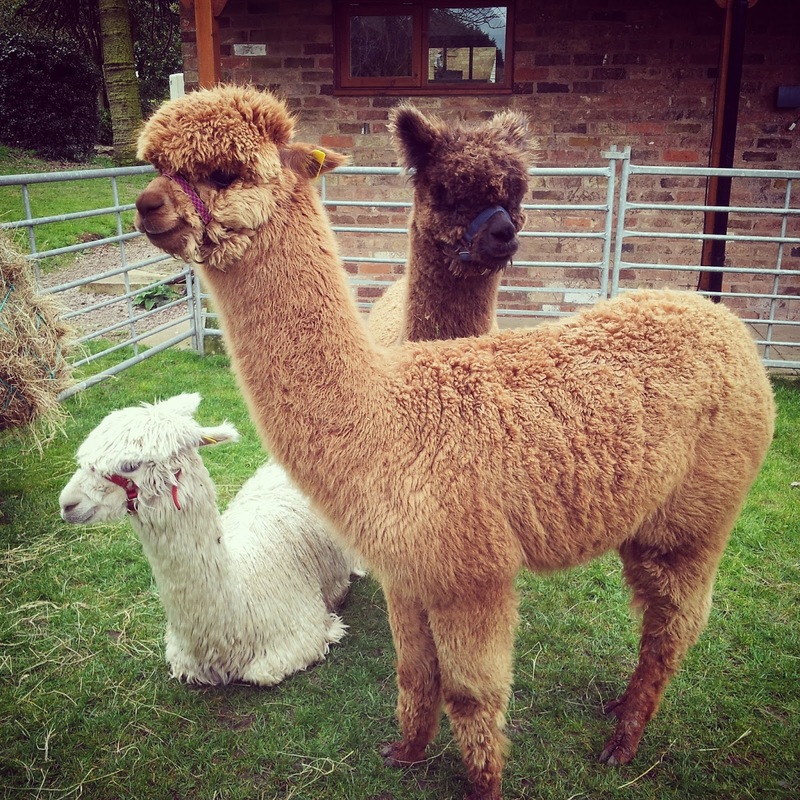 We walked our alpaca, who was reluctant to keep going, round and round and round. I suspect he was fed up with being walked around in circles for no good reason. M was happy, but cold, despite being bundled up against the weather. We posed, windswept and bedraggled, our alpaca reluctant to be with us. Our last stop was the cafe for some tea and a chance to warm up. M composed a poem about alpacas and I wrote it down for her. M's poem, written from the view of the alpaca. Lead me on a lead for I am a alpaca. Alpaca. Alpaca. 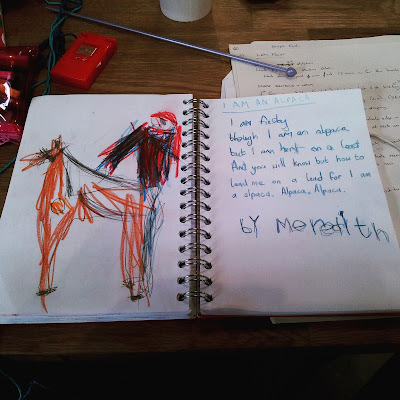 M illustrated the poem and traced over my writing with a blue pencil, then showed the poem to the lady who took us on the farm tour. She was told it was very good, then skipped off to run around outside. We finally headed home with a happy M, just as the rain started in earnest. Good timing on our part!